There also are sizable generational differences in opinions about immigrants. 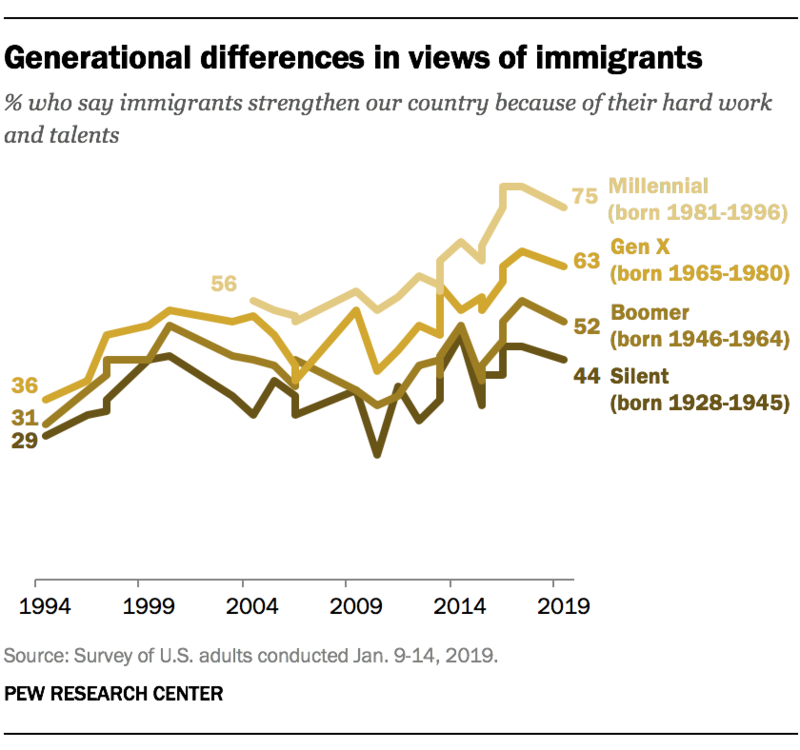 Three-quarters of Millennials (75%) say immigrants strengthen rather than burden the U.S. That compares with 63% of Gen Xers, 52% of Baby Boomers and 44% in the Silent Generation. In 1994, roughly comparable shares of Gen Xers, Boomers and Silents expressed positive views of immigrants. Generational differences are evident in both parties but are particularly stark among Republicans. More than half of Millennial Republicans (58%) say immigrants strengthen the country, compared with just 36% of Gen Xer Republicans and even smaller shares among older GOP generations. Among Democrats, there are only modest generational differences in these views, with no fewer than seven-in-ten of those in all generations saying this, including nearly nine-in-ten Millennial (88%) and Gen Xer (87%) Democrats.